Be the first to share your favorite memory, photo or story of Perry. This memorial page is dedicated for family, friends and future generations to celebrate the life of their loved one. Our beloved husband, father, Papa and great grandgrandpa, friend, and mentor Perry O. Orwick passed on January 27th, 2019 as he wished; at home at El Rancho on Bannock Highway in Pocatello, Idaho with his heartbroken wife, Georgia and his dear family physician, Dr. Brad Burton at his side. Perry was delighted to be the only child of Bruce and Marguerite Orwick. He never wished for siblings. His childhood in the 40's in Minot, North Dakota was idyllic with hours spent at the nearby Souris River swimming, fishing, and hanging out with the hobos, as they were known then, who camped under the tressle. His father later confessed that he sometimes "spied" on the boys to make sure they were safe and acted responsibly. Bruce had a soft spot for train riders as he rode the rails in his younger days to harvest apples in Washington. Perry's life was drastically altered at age 13 when he was diagnosed with tuberculosis and sent to a ward at the State Sanitorium in Dunsieth, North Dakota. It was a terrible experience for one so young. It was also very liberating when he learned that he had been misdiagnosed and could have a life; his would never be the same. He was grateful to live to celebrate his 78th birthday with his family. He was a devoted high school student and a talented musician. He was an enthusiastic Drum Major for the Minot Model Marching Band with memorable performances at football games. His rich baritone singing voice was in demand for special programs and weddings. He attended the University of North Dakota and was awarded his PhD in Clinical Psychology at age 27in 1968. With his wife Rube with their children, Randy, Nancy, and Kristin, they moved west--to Pocatello where Perry taught in the Psychology Department at Idaho State University. Later they moved to Rock Springs, Wyoming where he was the executive and clinical director of the Southwest Counseling Service. He founded the first suicide prevention center in Wyoming. He was a fierce defender of the right of patients to privacy and against easy involuntary commitments. He was passionate about the study of psychology, religion, and human nature, an interest he enjoyed throughout his life, as his library will attest. He was a powerful force for honesty and the quest for enlightenment and joy--for finding one's bliss. In 1971 Perry married Georgia Widicker Hieb and her 4 year old son Robert from Colorado Springs, Colorado. On their first date he took Georgia flying in a single engine Cessena and faked a stall. She passed his test! Their home in Rock Springs was the perfect base camp from which to spend as much time as possible exploring the Red Desert and camping in western Wyoming, often with best friends David and Pam Still. They moved to Bismarck, North Dakota in 1974 where Perry was the Regional Resident Educator for the State Social Service Board. Later, the family welcomed daughter Nancy while she graduated from Bismarck High School. In 1979 Perry and Georgia took a Leap of Faith and left their professional careers in Bismarck, North Dakota to "hit the road" on a 1978 Honda Gold Wing Motorcycle towing a camp trailer. Their first goal was to get to the coast of Maine and Acadia National Park to see the famous fall foliage and the Atlantic Ocean. They did! It was a fabulous adventure to live and travel to the ends of many roads; in Nova Scotia to Key West to Homer, Alaska where Perry was the oldest deck hand in the halibut sportfishing fleet. He spent fourteen summers working in Grand Teton National Park. for the Grand Teton Lodge Company where Perry held many positions such as the Chief of Security, Colter Bay Marina Manager, and the best was to give narrated tours on the 50 passenger tour boats on Jackson Lake. Perry was described as "Hemingway with a pony tail" by a reporter from U. S. News and World Report in a story about guided fishing trips in the great northwest. For six years he was a fishing guide for Signal Mountain Lodge Company with the notorious "Old Man of the Sea" Larry Jenkins who has fished on the Jackson Lake in the Tetons for more than 40 years. Perry also worked as a hunting guide for the Jenkins Blind Bull Hunting Camp in Wyoming. He was a snowmobile guide at Togwotee Mountain Lodge, at the top of the world at 9,500 feet with fresh powder every night and fabulous views of the Tetons. Another favorite job was as a jeep tour guide for Wild West Jeep Tours on huge private ranch outside of Cave Creek, Arizona. He often said,"I don't make much of a livin' but I have a good life". Perry and Georgia were a masterclass in joyful togetherness. Some of their most memorable adventures were to ride the ferry from Seattle to Haines Junction, Alaska and to travel around Alaska, to float the Colorado River through the Grand Canyon for 277 miles in 21 days on a 16 foot raft, to travel with backpacks on busses and trains through Mexico and Central America to the Costa Rica/Panama border, to live in the ejido of San Lucas Cove for deep sea fishing in their 16 foot aluminum Baja boat in the Sea of Cortez, to fish off of the Land's End at Cabo San Lucas in their 12 foot rubber raft when Perry accidentally hooked a swordfish which he looked in it's wonderful eye before releasing it to swim on, to travel across the No Man's Land between Honduras and Nicaragua on the Pan American Highway during the war, and to photograph the legendary sacred Quetzal bird in the Cloud Forest of Costa Rica. Perry was a talented photographer, videographer, narrator, and author of short stories and movies by Wild Goose Productions about their travels and his observations. To celebrate 25 years of marriage, Perry and Georgia took the year of 1996 off from work to play. They bought a sailboat and learned to sail on American Falls Reservoir. They sailed on Jackson, Flathead, and Pend Orielle Lakes on their way to Anacordes, Washington where they sailed the San Juan Islands for a month. On their way to the Baja of Mexico for the winter, they stopped in Pocatello to visit family when, by accident or miracle, they found their ranch on Bannock Highway where they have made their home since 1996. Perry was the fairway mower at Juniper Hills Country Club for 10 years with his Akita dog Saki at his side. 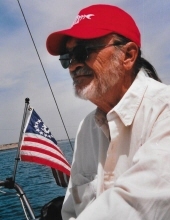 He loved living on his sailboat Raven's Magic at SeaGull Bay Marina on American Falls Reservoir and traveling south of the border in the winters. Perry was preceded in death by his parents and other family members as well as his son Randy Orwick and his daughter Nancy Orwick Schultz. He is survived by his wife Georgia Orwick; daughter Kristin (Michael) Glaser and family of Idaho Falls, Idaho and his son Robert (Kristin) Hieb and family of Pewaukee, Wisconsin; daughter-in-law Michelle Orwick (Glenn) Florence from Pocatello, Idaho; grandson Mark (Eveline) Siegel and family from Riverdale, Utah and grandson Ozzy (Laura) Orwick and family from New Orleans, Louisiana. The family is grateful to Dr. Brad Burton and Holly at MountainViewFamilyMedicine and the Hospice of Eastern Idaho for their compassion and care. To send flowers or a remembrance gift to the family of Perry O'Dell Orwick, please visit our Tribute Store. Guaranteed delivery before Perry's service begins. "Email Address" would like to share the life celebration of Perry O'Dell Orwick. Click on the "link" to go to share a favorite memory or leave a condolence message for the family.